As arguments go, this one comes just before “but all the other kids were doing it” on the list of Worst Reasons Ever for making a particular decision. And in this case, it’s not even accurate. Marriage as we know it today looks nothing like marriage “for millennia.” The justices could use a quick tutorial. A favorite example of conservatives, “Biblical marriage,” is a good place to start. The first marriage we see up close in the Bible comes in Genesis, when we meet Abraham and Sarah. Alas, Sarah can’t get pregnant so she offers her maid Hagar to her husband and he willingly beds and impregnates her. Is this an example of traditional marriage to which we should all aspire? In the Old Testament, polygyny (one man and more than one wife) was common, and in fact was a practical response to female infertility, short lifespans, and unexpected changes to family structure (Deuteronomy 25:5 requires a brother to marry his deceased brother’s wife if she has no sons, keeping her in the family). Notice a theme? Women were at best breeding machines, and at worst, property to be reluctantly maintained until death. For much of human history, females spent their whole lives as someone’s property, first their father’s and later their husband’s (and if the husband died, God forbid, they were at the mercy of their in-laws). This is still the case in many societies today, with tragic but predictable side effects like infanticide of female babies and arranged marriages of girls barely in their teens. For millennia, marriage was less about a relationship between two people than about the transfer of property from one family to another. The rich and royal got married to join kingdoms, create heirs, and form political alliances. For rich commoners, marriage was a way to merge families, real estate, and wealth. Even for poor or middle class people, the institution of marriage existed for mostly practical reasons – running a farm or a small business was easier when two people worked on the chores. Lots of men never learned domestic skills and until recently women couldn’t earn money outside the home, so marrying was just a way of getting by in life. Marriage has changed a lot in the last several thousand years, and mostly for the better. One of the best advancements in modern, Western marriage has been the introduction of choice and consent of the parties involved. Most Americans don’t believe that women should be forced to marry against their wills, or that marriages should be arranged by extended families. Today, we fall in love and we are free to choose our mates. We willingly enter binding contracts where both parties make equal, life-long commitments to each other. This is absolutely not the way it’s always been, but it is the way it should be from now on. 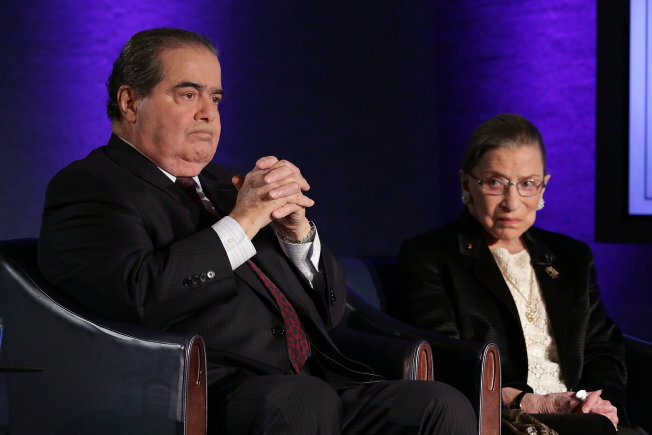 Let’s hope Ruth Bader Ginsberg will enlighten Scalia over a nice bottle of Chianti. This entry was posted in Observations and Musings, Politics and tagged antonin scalia, arguments for gay marriage, biblical marriage, gay marriage, human rights campaign, ruth bader ginsberg, supreme court, traditional marriage on April 28, 2015 by lmctaggart2013. 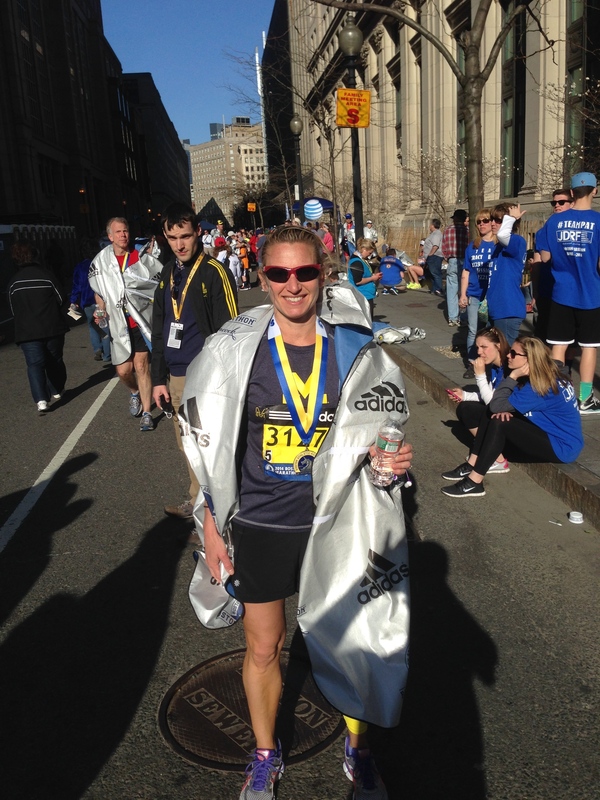 A year ago, I ran the Boston Marathon. This year’s race will bring back plenty of memories and a flood of emotions, none stronger than relief that I don’t have to run 26.2 miles ever again. I was a nervous novice last April when I boarded a bus to the starting line from the Boston Common. My seatmate for the hour-long ride was an ultra-marathoner from California, whose many running achievements included completing 3 marathons in 3 consecutive days. Hearing all this comforted me, because he was living proof that such torture was survivable. Maybe 26.2 miles wouldn’t kill me after all. The “Athletes Village” in Hopkinton, where the Boston Marathon begins, is less a village than a muddy field of port-a-johns. As I waited for one, I considered the fact that I’d just taken a really long ride so that I could spend the next few hours (OK, several hours) hoofing it right back to where I’d boarded that bus. Apparently insanity loves company, because 36,000 others were in the same boat. The starting line, where I joined a gamer crowd of other charity runners with more chutzpah than sense, was a party. The loudspeakers, the banners, and the happy crowds promised 26.2 miles of bliss. Or something. The first mile was a blur; a joyful celebration. Several helpful spectators offered us beer and donuts, suggesting this race was all going to be such great fun! 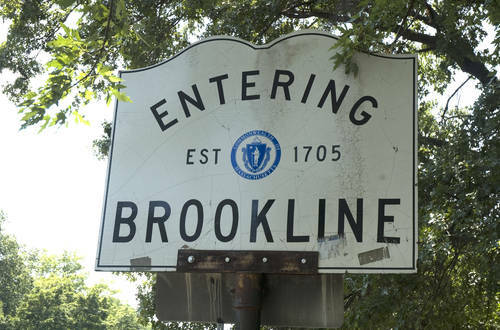 After about 2 miles, I passed an iconic Boston sign informing me that I was “Entering Brookline.” Good one, Ashland! This marathon offers some of the world’s best people watching. I’d always enjoyed watching the runners, but watching the crowd from the middle of the road was even better (except that I had to be, well, running). In 2014, I swear that every third person wore some variation of a Boston Strong t-shirt. Not all the people watching was motivating, like the hundreds of runners who dashed off the course and into the trees (sometimes not nearly far enough into the trees) to take care of personal business. Let’s just say the call of nature was more than birdsong and the whistling wind. Thankfully I avoided this detour, meeting one of my major marathon goals (some people want to run fast; my goal was to cross the finish line while still vertical and to avoid peeing in the woods). Things started to get interesting in Wellesley. This is the halfway point of the race, and a famous milestone because of the screaming college women holding signs begging runners to stop and kiss them. Whether this is a charming tradition or a sign of the feminist apocalypse depends on your perspective. I pondered the question with the limited oxygen that remained in my brain as I passed the campus, un-kissed. Wellesley leads into Newton, where I planned to shine in all my glory. The Newton Hills may be intimidating and daunting, but they are my home turf! I’d run up and down those hills hundreds of times (though never after a 17-mile warm up). No sweat. Ah, there was plenty of sweat. One enterprising little boy, an angel right from heaven, offered me a dripping sponge from his bucket of ice water. That sponge had surely swabbed the loamy armpits and dripping noses of God only knows how many other runners, but on race day, germs were way low on the list of things I was worried about. Well, yes and yes. It still sucked. But the gauntlet crowds of Boston were like nothing I had ever experienced. Running past the Citco sign in Brookline and crossing into Boston felt like being pushed by a powerful ocean wave. The city embraced me and enveloped me and the finish line just met me like an old friend. This Marathon Monday, I’ll be watching by the Newton Hills. I don’t miss the running, but I do miss fueling for the running. They say you learn a lot about yourself while training for a marathon, and I learned two things: first, I am not a fast runner. Second, I am excellent at consuming carbs. 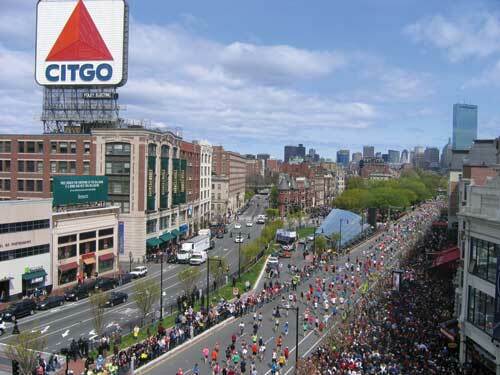 To the Boston Marathon field of 2015, I say good luck. When you board the buses in Boston Common, I’ll be on my second cup of coffee. When you pass Ashland, I may break out the beer and donuts. And when you cross that finish line, I’ll salute your stamina and have another beer. Because I wasn’t bragging – I really am fantastic at consuming carbs. This entry was posted in Observations and Musings, Sports and tagged 2014 Boston Marathon, 2015 Boston Marathon, Boston Marathon, Heartbreak Hill, marathons, Newton Hills, running on April 17, 2015 by lmctaggart2013.